What Is Reglazing? Why Reglaze? Shouldn’t I Just Replace? Reglazing or refinishing is an economical alternative to replacing. 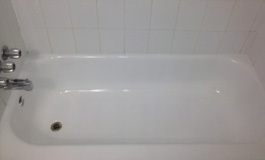 If you are looking to renovate or remodel your bathroom, and the bathtub, tub-surround tiles or sink are in good condition, structurally sound, and you don’t want to rip them out, then just keep them and reglaze them. They don’t make sinks, tiles and tubs like they used to, so keep them and have Dr Tubs reglaze them. New enamel can be applied by spraying special paints to their surfaces giving them a brand new look and feel. The first, or preparatory stage, is where the surface is cleaned and an acid etch is performed to help with the paint adhesion. If the surface has been reglazed previously, the paint will be chemically stripped off before being etched. During the preparatory stage, the surface is cleaned several times – carefully removing any dirt, soap scum, grime and calcium / lime deposits. Lastly, any body work needed to repair chips, fill in holes or depressions, remove rust, or build up any areas, are completed before moving on to the next stage. The second stage is the spraying stage. The surfaces around the area to be sprayed are covered or masked, to prevent them from being reglazed. The technician will spray a total of 3 primer coats followed by 3 topcoats. Afterwards, caulking is applied all around. The paint has a 24-hour dry time, so the sink, tub and tiles can be used the very next day. If they can be left unused, the new enamel will cure stronger, the longer they are allowed to cure. Once the glaze is cured, it will feel smooth and look uniform and shiny – giving you the impression that it’s brand new! Bathroom remodelling, renovation services provided by Dr. Tubs. A professional bathtub reglazing company. 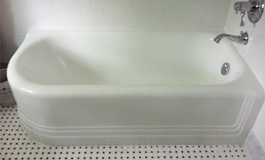 Tub resurfacing, sink refinishing and clawfoot tubs.